Here we talk about electricity, the thing we badly need to let our society function. Electricity does not come for free, but it is produced and delivered via a very complex system. Our role is to understand how this system is changing to support legislation and regulation. Below you can learn about some of the main features, challenges and curiosities related to electricity. Electricity is a form of energy resulting from charged particles. What's the meaning of the electricity word? The electricity word comes from the Greek, meaning amber and referring to the electrostatic properties displayed by amber when rubbed with a cloth. Does electricity flow at the speed of light? Electricity flows at a speed slightly and/or considerably (depending on the material of the wire) lower than the speed of light. Electricity, when travelling in the vacuum, reaches the speed of light. How do we measure electricity? Electric current is measured in amperes (A). Electric potential energy is measured in volts (V). Why can birds safely rest on electricity transmission lines? Because their feet, very close to each other, only touch one line (of the usually three lines). If the birds ever touched a second line - e.g. with a wing - they will be in trouble. What is the mission of the electric power system? The mission is to generate electric power and to deliver it to the users. This rather complex system is formed by a set of different components and can be divided into a number of main different subsystems. What subsystems does the power system include? The power system includes the generation, transmission, distribution and utilisation subsystems in its more traditional form. 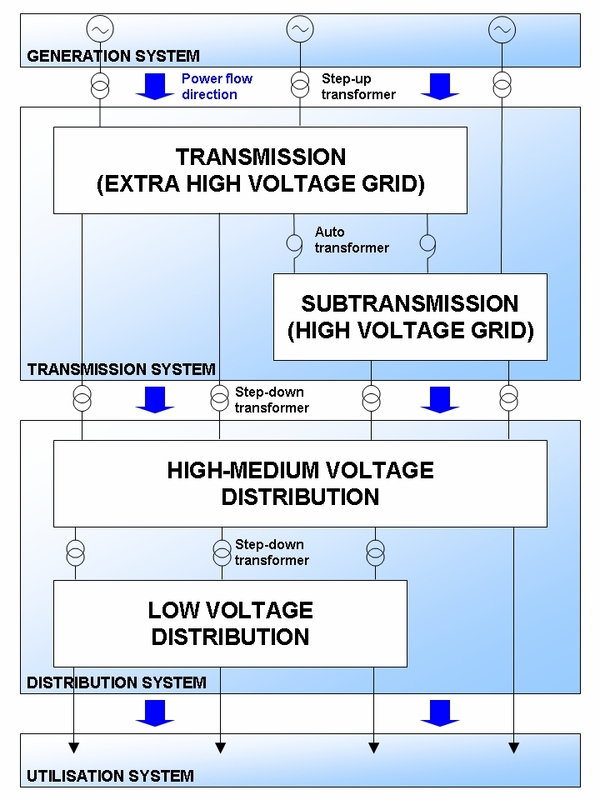 The Figure shows a schematic representation of the electric power system with the different subsystems interlinked by various types of transformers (step-up, step-down and autotransformers). In the traditional scheme of the electric power system, electricity is mostly generated in large power plants, like thermal, nuclear or hydroelectric plants, which are centrally controlled and coordinated within the power system (with a large deployment of Distributed Generation, this scheme may be subject to changes). The power produced in the large plants has to be delivered to the users, which are generally located far away from the generation sites. Hence, it is injected into the grid in order to reach all consumers. Basically, the grid consists of two infrastructures: the transmission system and the distribution system. The former carries extra high and high voltage electricity from the power plants and transmits it over long distances (there are also few big industrial consumers directly supplied by the transmission network). The latter draws lower voltage electricity from the transmission lines and delivers it to the customers on a more local basis (utilisation system in Figure). The subtransmission network is the lower voltage transmission system and represents the interface between the transmission and the distribution network. Even the distribution system can be generally split at least in two subsystems: a high/medium voltage distribution network and a low voltage one. What are the power system's main components? The main components are: synchronous generators with their voltage and speed regulators; transmission and distribution lines (overhead and underground cables), towers, substations with transformers and autotransformers; induction motors and loads in general; different types of switchgears, circuit breakers and protections for the lines and the various devices; mechanical and electronic controllers of parameters like voltage magnitude and angle difference, frequency, active and reactive power flow. A smart grid is an electricity network that can intelligently integrate the behaviour and actions of all users connected to it - generators, consumers and those that do both – in order to efficiently deliver sustainable, economic and secure electricity supplies. What are the expected benefits of a smart grid? - Foster market integration towards European integrated market. Does the whole power system operate at the same voltage level? The power system operates at different voltage levels as the generation, transmission, distribution and utilisation subsystems generally work better in specific voltage ranges. Therefore the lines linking them need transformers or transformation substations, where the voltage rate is changed and accordingly adjusted to the required level; step-up transformers increase the voltage, while step-down transformers decrease the voltage level. How are final users usually connected to the grid? The universally adopted approach to supply electricity users is the one in shunt mode, in which the different consumers are subject to the same voltage level (within the range of voltage variation). In other terms, each customer is connected between the powered line and the ground ('in parallel mode') and not inserted serially on the powered line. Is the power system mostly operated with alternating current? The power system mostly operates with alternating current (AC); the other possible mode, that is, by direct current (DC), is used for some specific applications. The amount of electric power, which is transmitted and used, results by the voltage multiplied by the current and is proportional to the amount of energy (through the time). The values of voltage and current in a point of the system are related by Ohm's and Kirchhoff's laws. In the alternating way, the current and the voltage are not constant over time like in the DC supply, but vary sinusoidally with time. These time functions oscillate with a frequency which is typically 50 Hz (e.g. in Europe) or 60 Hz (e.g. in the United States). These values result from a compromise between different techno-economic choices concerning the various system components. Historically, at the beginning (end of 19th century) the electric power system was operated in DC. However, after the introduction of AC electrical machines (like power transformers, induction motors and synchronous generators) the operation of the system in AC became preferable. In fact, the utilisation of power transformers, which are able to change the voltage level in a smooth way, allows a power transmission and distribution in AC at higher voltages. Thus, at constant power the currents and then the electrical line losses (which are proportional to the square of the currents) can be reduced. To minimise the losses in the system, the aim is consequently to transmit power at the highest possible voltage compatible with techno-economic limits. This feature of power transformers, together with the lower maintenance required by these machines and their longer life, is very important for their utilisation. In fact, on one side, power generators are constrained (due to conductor insulation) to operate at a voltage level not higher than a certain value (generally 30 kV maximum). On the other side, the loads, depending on their constructive characteristics and also for safety reasons, have to operate at lower voltage. Then, power transformers step the voltage up from generation to transmission level and then step it down to distribution and utilisation levels. Furthermore, AC rotating components such as induction motors and synchronous generators are undoubtedly more reliable and suitable for industrial applications and power generation, respectively, than the corresponding DC ones. Another reason which led to prefer the AC supply is that an alternating current in its sinusoidal variation crosses the zero value and can be more easily interrupted than direct current. What is the reactive power and how is it produced? Reactive power is a consequence of running power systems with alternating current. It represents energy stored and released by inductors and/or capacitors. Indeed, in the presence of energy storage elements such as inductors and capacitors, the total power is larger than the real 'true' power in alternating current systems. (The real 'true' power is the power that is actually available, e.g. to produce lighting and drive electric motors). This increase is due to the reactive power alternately stored and released by inductors and/or capacitors. Capacitors produce reactive power, while inductors absorb it. The real (also defined active) power and the reactive power are then the components of the total power, known as apparent power. The presence of reactive power reduces the capacity of an AC line or system because it limits the flow of real power that can be transmitted. In fact, the reactive power uses up some of the ability of the line to carry the current. Are there situations where direct current is preferred in the power system? In specific situations where the absence of reactive power is required, direct current (DC) mode is preferred, although the electric power system is mostly operated in alternating current mode. This occurs for long distance transmission lines, for undersea cables (generally longer than 30 km) and for interconnections between two systems at different frequency or with stability problems. In fact, in case of long lines (due to the conductor's inductance) or undersea cables (due to the large capacitance), the reactive power can reach very high levels. This high reactive power tends to reduce the conductors’ capacity, restraining the amount of active power free to circulate in the system. The HVDC (High Voltage Direct Current) system, equipped with AC/DC and DC/AC converters at both ends of the line, is a mature technology for long distance and undersea power transmission. Why are 3 (or even 4) wires used for power delivery? The alternating current systems are widely operated in a three-phase mode, i.e. utilising three separate wires (or phases), each one of which carries the current, to transmit power. In the three-phase system the currents are sinusoidal functions of time, all at the same frequency but with different phases. A three-phase system, in which the phases are spaced equally and separated by 120°, is practically and economically more convenient than a single-phase system. This can be explained for instance in terms of easier exploitation of three-phase induction motors. These machines play a key role, especially in industrial applications, and are simpler and more robust than single-phase induction motors. Also, in specified conditions, the total section of conductor material needed for a three-phase transmission is proved to be 25% smaller than the one necessary for the equivalent single-phase transmission. In a three-phase system there is also a fourth wire, the neutral line, which is normally held at a null voltage. This neutral wire assumes particular importance for the power supply of small loads at low voltage by two lines (one phase and the neutral as return wire for the current).